Sanctuary Island is honestly becoming one of my favorite settings for companion novels. Seriously, there is something about this place. It’s so magical, and it has such a way of bringing people together, and helping them get through things even when it seems as if it seems like it may not be possible. Oh, and it has wild horses. This time around in Heartbreak Cove, Lily Everett (re)introduces us to Sheriff Andie Shepard and reformed bad-boy Sam Brennan. We had a brief encounter with them before at Ben and Merry Faulkner’s wedding. Initially, they don’t see eye to eye at all as Sheriff Andie takes her job very seriously, and Ben does not want anything to do with someone who is so aptly dedicated to the law. He has personally been bruised by it one too many times before, and he has a tendency to work against it instead of with it. Except Andie is all that he thinks about….and he knows that is not a good thing. Sam and Andie are so dynamic together. Out of the three Sanctuary Island novel romances which have been published so far, these two are by far my favorite couple. There is just something about the two of them that had me smiling from page to page. There is a lot of growth between these two characters as their relationship develops. It is not rushed or forced, and it allows a real sense of trust to develop between them. Much of this trust also has to do with Andie’s ten old niece, Caitlin. Caitlin is an unexpected presence in Andie’s life as she didn’t even know that she had a niece prior to a brief phone call with her brother Owen. Caitlin had never met her father because he was kept in the dark about the pregnancy only finding out after Caitlin’s mother died. Owen entrusts his sister with his daughters care while he is on an undisclosed mission an Army Ranger. Andie doesn’t know the first thing about being a mother due to a fractured childhood but she is determined to do what she can to be there for her niece. Of course, this is not going to be an easy journey but it is a journey that is made a little bit easier with a man like Sam in her corner. The setting of Sanctuary Island works its magic for this couple as well. Like I said, there is something so compelling about this tiny island where everyone is looking out for each other but where little pockets of internal drama can still occur. An island where second chances seem actually possible, and the romances that occur are realistic and heartfelt and just beautiful. One of the strongest components of Heartbreak Cove is the rehabilitating of horses, especially a horse named Queenie, who Sam may have brought to the island in less than stellar condition. Queenie helps build the relationship between Andie, Sam, and Caitlin but she also holds the ability to determine if the trust between the three of them is enough to last even the darkest of situations. Reading about ten year old Caitlin and her connection with Queenie was definitely a throwback for me to my days of being younger and in love with horses and wishing for nothing more than the ability to ride them (even the most wildest of ones). Unfortunately for me, I never really had that ability but luckily for Caitlin, she does and she loves it which is good because Caitlin also has some demons which she has had to deal with even at her very young age. There are plenty of twists and turns which take place within the pages of Heartbreak Cove. I mean, when you’re working with a romance between a sheriff and an ex-con, surprises are to be expected, right? And trust me when I say that Lily Everett did not let me down with any of them. I was hooked straight the entire story, and I’m pleased to say that I left with a smile upon my face. This truly is a wonderful story of life, love, and second chances. Well, except for the epilogue….I don’t want to say too much…well….except….I cannot wait for the next installment of the Sanctuary Island novels now! And it has a Christmas setting? Oh my. Christmas romance in Sanctuary Island? Bring it on! 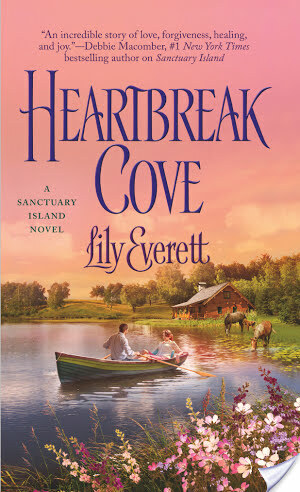 Oh, Heartbreak Cove sounds like a great read! Plus, I love the sound of Sanctuary Island as a setting. It seems like the sort of place that would draw broken, beautiful people together and help make them whole again.